Herein, the authors report a case of AHEM with remarkable abnormalities of brain magnetic resonance imaging (MRI) who had an unfavorable outcome. Besides, a review of similar pediatric cases previously reported in the literature has been given. A 2-year-old, previously healthy girl was admitted to the hospital with a 1 week history of extreme irritability. Associated with irritability, her parents noticed progressive difficulty in walking. She did not have any antecedent history of infection or vaccination preceding the present symptoms. The neurological examination on the first evaluation showed impairment of consciousness, ranging from irritability to numbness. She was unable to walk without support due to cerebellar ataxia. Brisk deep tendon reflexes, bilateral Babinski sign and ankle clonus were present. Computed tomography scan was normal and the cerebrospinal fluid showed the following: white cell count 15 cells/mm 3 (92% lymphocytes, 3% monocytes, 3% neutrophils), red blood cells 15/mm 3 , protein levels 70 mg/dL, gamma globulin levels 18.3% on protein electrophoresis, and glucose levels 47 mg/dL. Acid-fast bacilli staining was negative as was polymerase chain reaction for herpes simplex and cytomegalovirus. Fungal and bacterial cultures were negative. The first MRI showed hyperintense FLAIR/T2 lesions in cerebellar white matter [[Figure 1]a], and also in central, periventricular and juxtacortical white matter [[Figure 1]b and c]. She had significant improvement after IV administration of high-dose intravenous methylprednisolone (30 mg/kg/day) for 5 days, followed by oral prednisolone (2 mg/kg/day) taper for 6 weeks. After 2 months of the initial symptoms, she had recurrence of her symptoms, associated with rapidly progressive refractory status epilepticus. An electroencephalogram obtained showed delta wave activity that was consistent with diffuse, severe encephalopathy. Continuous sharp waves on parasagittal and right temporal regions were observed in the records. It was necessary to administer IV midazolam (23 μg/kg/min) followed by thiopental (50 mg/kg/hour) to control the seizures. 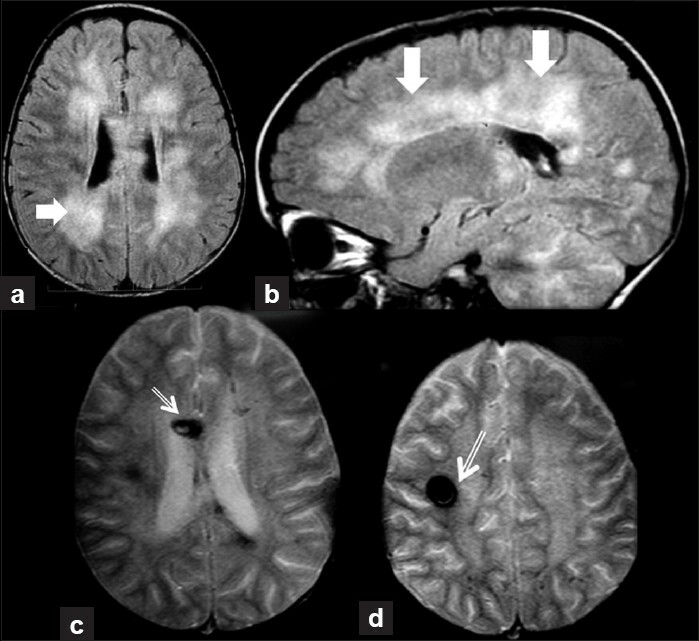 The second MRI, in addition to the impairment of cerebral and cerebellar white matter [[Figure 2]a and b], showed hemorrhagic lesions in the corpus callosum and right centrum semiovale [[Figure 2]c and d]. She was submitted to a new high-dose IV steroid therapy and IV immunoglobulin, but no improvement was observed and she died after a nosocomial pneumonia following 2 months of intubation. Because of the epidemiological data, and especially the outcome between ADEM and AHEM, some authors have tried to separate these conditions. ,,, However, distinction between ADEM and AHEM is not well established and they may be a continuation of disease spectrum. ,,, The case presented herein is in agreement with the concept that both disorders are considered as autoimmune-mediated entities, with pathological features of prominent multifocal perivascular demyelination. The patient had a typical presentation of ADEM with an initial good response to steroids, and in an unexpected way, she relapsed with recurrence of symptoms associated with refractory status epilepticus, and a new MRI disclosing hemorrhagic features. As the relapse took place within the first 3 months from the initial event, it was considered temporally related to the same acute monophasic condition,  but with subsequent vessel occlusion leading to a secondary hemorrhage. The case reported here emphasizes that ADEM may present a severe outcome, making this well-known condition a challenge. AHEM must be properly investigated with MRI whenever a patient presents with unexpected neurological worsening. Aggressive therapeutic management is required in order to avoid fatal outcome. 1. Tenembaum S, Chitnis T, Ness J, Hahn JS; International Pediatric MS Study Group . Acute disseminated encephalomyelitis. Neurology 2007;68 (16 Suppl 2):S23-36. 2. Dale RC, de Sousa C, Chong WK, Cox TC, Harding B, Neville BG. Acute disseminated encephalomyelitis, multiphasic disseminated encephalomyelitis and multiple sclerosis in children. Brain 2000;123:2407-22. 3. Mikaeloff Y, Suissa S, Vallée L, Lubetzki C, Ponsot G, Confavreux C, et al. First episode of acute CNS inflammatory demyelination in childhood: Prognostic factors for multiple sclerosis and disability. J Pediatr 2004;144:246-52. 4. Leake JA, Billman GF, Nespeca MP, Duthie SE, Dory CE, Meltzer HS, et al. Pediatric acute hemorrhagic leukoencephalitis: Report of a surviving patient and review. Clin Infect Dis 2002;34:699-703. 5. Rosman NP, Gottlieb SM, Bernstein CA. Acute hemorrhagic leukoencephalitis: Recovery and reversal of magnetic resonance imaging findings in a child. J Child Neurol 1997;12:448-54. 6. Anlar B, Basaran C, Kose G, Guven A, Haspolat S, Yakut A, et al. Acute disseminated encephalomyelitis in children: Outcome and prognosis. Neuropediatrics 2003;34:194-9. 7. Hurst EW. Acute hemorrhagic leukoencephalitis: A previously undefined entity. Med J Aust 1941;1:1-6. 8. Tenembaum S, Chamoles N, Fejerman N. Acute disseminated encephalomyelitis: A long-term follow-up study of 84 pediatric patients. Neurology 2002;59:1224-31. 9. Takeda H, Isono M, Kobayashi H. Possible acute hemorrhagic leukoencephalitis manifesting as intracerebral hemorrhage on computed tomography. Neurol Med Chir (Tokyo) 2002;42:361-3. 10. 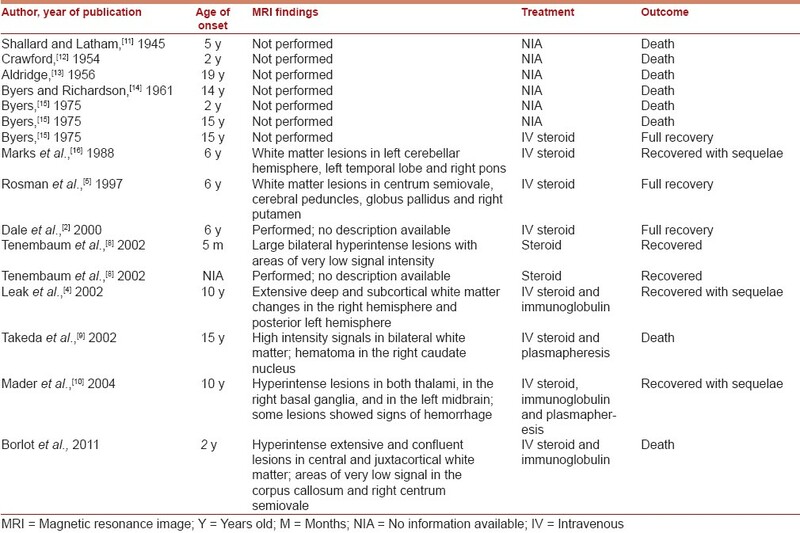 Mader I, Wolff M, Niemann G, Küker W. Acute haemorrhagic encephalomyelitis (AHEM): MRI findings. Neuropediatrics 2004;35:143-6. 11. Shallard B, Latham O. A case of acute haemorrhagic leucoencephalitis. Med J Aust 1945;1:145-8. 12. Crawford T. Acute haemorrhagic leuco-encephalitis. J Clin Pathol 1954;7:1-9. 13. Aldridge HE. Acute haemorrhagic leuco-encephalitis. Br Med J 1956;6:807-8. 14. Byers RK, Richardson EP Jr. Case records of the Massachusetts General Hospital: Case48-1961. N Engl J Med 1961;265:34-40. 15. Byers RK. Acute haemorrhagic leucoencephalitis: Report of three cases and review of the literature. Pediatrics 1975;56:727-35. 16. Marks WA, Bodensteiner JB, Bobele GB, Hamza M, Wilson DA. Parainflammatory leukoencephalomyelitis: Clinical and magnetic resonance imaging findings. J Child Neurol 1988;3:205-13. 17. Klein C, Wijdicks EF, Earnest F 4 th . Full recovery after acute hemorrhagic leukoencephalitis(Hurst's disease). J Neurol 2000;247:977-9. 18. Ryan LJ, Bowman R, Zantek ND, Sherr G, Maxwell R, Clark HB, et al. Use of therapeutic plasma exchange in the management of acute hemorrhagic leukoencephalitis: A case report and review of the literature. Transfusion 2007;47:981-6. 19. Markus R, Brew BJ, Turner J, Pell M. Successful outcome with aggressive treatment of acute hemorrhagic leukoencephalitis. J Neurol Neurosurg Psychiatry 1997;63:551. Granget, E. and Milh, M. and Pech-Gourg, G. and Paut, O. and Girard, N. and Lena, G. and Scavarda, D.